I don’t remember exactly how I met him; he was just that bouncy, floppy kid who always had a smile and some excited words for everyone that first spring at Gilman. I knew he’d played in a band called Basic Radio, and I knew that he was bummed that they’d broken up. Then I went away for three months, and when I got back the first thing I heard was that there was this great new band at Gilman called Operation Ivy and that they were playing that night. When I got to Gilman, there was Tim out front, only now he wanted to be called Lint, and he was more excited than I’d ever seen him. “I got a new band, Larry. It’s called…” Yeah, you got it. I went inside and watched one of the most amazing shows I’d ever seen, and when Tim got off stage and asked me what I thought, I said, “Let’s make a record.” At the time there was no Lookout Records, and I didn’t have the slightest idea how such a record would ever come about, but I just knew it had to. How important were Operation Ivy to Lookout Records and the whole East Bay scene? I kind of doubt we’d even be here without them. Tim and Matt went on to form Rancid and gain even more fame, but they never forgot their roots: listen to them sing about the Operation Ivy story on the Rancid song “Journey To The End Of The East Bay,” where Tim proclaims about Gilman: “That place was sacred ground to me.” But though Tim and Matt are the Op Ivy alumni that everyone knows about, it would be foolish indeed to forget Jesse Michaels, who not only penned their brilliant and evocative lyrics and sung them in a passionate, instantly recognizable voice that could soar from throaty growl to angelic innocence in the turn of a phrase, but also created all the artwork that now adorns punkers’ shirts and packs around the globe. 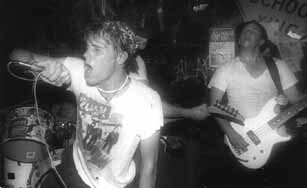 Anchored by the seemingly effortless, but never less than excellent drumming of Dave Mello, Operation Ivy came and went with the fleeting incandescence of a comet that will remain emblazoned forever on the consciousness of anyone who ever had the privilege of witnessing them in their glory. They stand, and undoubtedly always will, among the handful of bands that truly matter.